Draft: 2011, Cleveland Indians, 19th rd. Shawn Peter Morimando... Graduated from Ocean Lakes HS in Viginia Beach, VA... As a senior, set single-season school records for strikeouts in a season (115) and games (15)...Also holds school records for home runs (6) and RBI (31) in a season... Signed to play baseball at East Carolina prior to signing with Cleveland. 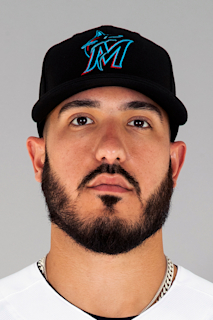 Started the season with Triple-A Columbus and went 1-3 with a 7.03 ERA across five starts... Was placed on the DL on May 1 and later released on July 1... Signed a Minor League contract with the Blue Jays on July 9 and was placed on the DL until Aug. 18... Made four rehab starts with the GCL Blue Jays and allowed just one run over 7.0 innings... Joined Triple-A Buffalo for his last four starts of the season...Went 1-3 with a 4.50 ERA for the Bisons to close out his 2018 campaign. Spent virtually the entire Minor League season with AAA Columbus, posting a mark of 10-9 with a 4.41 ERA in 26 starts (159.1IP, 177H, 78ER, 57BB, 128SO)...At the time of his September 1 recall to Cleveland he led International League in innings (159.1), starts (tied with 26), complete games (4) and shutouts (3), ranked seventh in strikeouts (128) and tied for seventh in wins (10)...Among organizational pitchers, he ranked third in innings and fourth in strikeouts as of September 1, 2017...Spent month of September with the Indians and did not appear in a game... Named an MiLB.com Organization All-Star (LHP)…He went 4-0 with a 1.43 ERA in 5 June starts with 2 CG shutouts (37.2IP, 29H, 6ER) on June 15 vs. Durham (9.0IP, 5H, 0BB, 3BB, 2SO) and June 27 at Charlotte (9.0IP, 5H, 0R, 0BB, 12SO)...Tossed his third CG, SHO in his next start of July 2 at Toledo (9.0IP, 7H, 0R, 1BB, 6SO) to give him a scoreless IP of 18.0IP...Went 9-5 with a 3.29 ERA in 17 first half starts (109.1IP, 113H, 40ER) and 1-4 with a 6.84 ERA in 9 second half starts (50.0IP, 64H, 38ER). Had an outstanding season between AA Akron and AAA Columbus and made his first two appearances at the Major League level in July and August...Was with the Major League club on July 2 and August 5...Made his Major League debut on July 2 at Toronto, the day after the club's 19-inning marathon that necessitated several roster moves (3.2IP, 6H, 2R/ER, 1BB, 4SO)...Also appeared in relief on August 5 at New York-AL (1.0IP, 3H, 4R/ER, 4BB, 1SO)...Combined on the year he went 15-5 with a 3.25 ERA in 27 starts (152.1IP, 141H, 55ER, 57BB, 119SO, .247 avg against, 10 homers allowed)... Started the year with Akron, was promoted to Cleveland on July 2, and spent the remainder of the season in AAA Columbus following his July 3 option and August 5 promotion (was optioned back to AAA on Aug. 6)...Led all Indians Minor League pitchers with 15 wins, was tied for third in innings (152.1) and tied for sixth in strikeouts (119)... Was named an organizational all-star by MiLB.com and was a Double-A Eastern League midseason all-star selection...Won his first 9 decisions for Akron, going 9-0 with a 1.64 ERA over his first 11 starts from April 8-May 31 (66.0IP, 45H, 12ER, 23BB, 47SO)...Had 4 outings of at least 5.2IP with 0 earned runs allowed in that stretch...Lefties hit just .177 (17-96, 1HR) off him at Akron...ERA at Columbus was 2.62 over his first ten starts from July 7-August 29 (55.0IP, 47H, 16ER) before allowing 7 runs (7ER) in 4.0IP in his final start of the season vs. Toledo to raise his Triple-A ERA to 3.51... Rated by Baseball America as having the best slider in the Indians organization. Netted career-bests in virtually every category, posting the 4th-lowest ERA and 5th-most strikeouts in the Indians organization... Among Eastern League pitchers he finished tied for 1st in starts (28), tied for 5th in strikeouts (128), 7th in innings (158.2) and 9th in ERA (3.18)... Over his last 11 starts on the year he went 5-3 with a 2.74 ERA after July 14 (65.2IP, 61H, 20ER, 58SO)...Very tough on left-handed hitters, limiting lefties to a .163 (23-141, 1HR, .441 OPS) average against. Combined to go 10-9 with a 3.30 ERA (56 ER/152.2 IP) between Class A-Advanced Carolina and Double-A Akron. 28 de enero de 2019 Toronto Blue Jays invitado fuera del roster LHP Shawn Morimando para spring training. 18 de agosto de 2018 Buffalo Bisons activan a LHP Shawn Morimando de la 7-d&iacute;a lista de lesionados. 1 de agosto de 2018 Buffalo Bisons envian a LHP Shawn Morimando una asignaci&oacute;n de rehabilitaci&oacute;n a GCL Blue Jays. 1 de agosto de 2018 Buffalo Bisons ponen a LHP Shawn Morimando on the 7-d&iacute;a lista de deshabilitado retroactivo al July 11, 2018. 9 de julio de 2018 Toronto Blue Jays agente libre firmado LHP Shawn Morimando con un contrato de la ligas menores. 9 de julio de 2018 LHP Shawn Morimando asignado a Buffalo Bisons. 1 de julio de 2018 Columbus Clippers liberan a LHP Shawn Morimando. 1 de julio de 2018 Cleveland Indians liberan a LHP Shawn Morimando. 3 de mayo de 2018 Columbus Clippers ponen a LHP Shawn Morimando on the 7-d&iacute;a lista de deshabilitado retroactivo al May 1, 2018. 12 de marzo de 2018 Cleveland Indians opcionado LHP Shawn Morimando para Columbus Clippers. 12 de octubre de 2017 Cleveland Indians activan a LHP Shawn Morimando. 5 de octubre de 2017 Cleveland Indians reasignado LHP Shawn Morimando a las ligas menores. 1 de septiembre de 2017 Cleveland Indians llamado LHP Shawn Morimando de Columbus Clippers. 20 de marzo de 2017 Cleveland Indians opcionado LHP Shawn Morimando para Columbus Clippers. 3 de noviembre de 2016 Shawn Morimando estado en la lista cambian a por Cleveland Indians. 6 de octubre de 2016 Cleveland Indians reasignado LHP Shawn Morimando a las ligas menores. 3 de octubre de 2016 Cleveland Indians llamado LHP Shawn Morimando de Columbus Clippers. 6 de agosto de 2016 Cleveland Indians opcionado LHP Shawn Morimando para Columbus Clippers. 5 de agosto de 2016 Cleveland Indians llamado Shawn Morimando de Columbus Clippers. 3 de julio de 2016 Cleveland Indians opcionado LHP Shawn Morimando para Columbus Clippers. 2 de julio de 2016 Cleveland Indians llamado Shawn Morimando de Akron RubberDucks. 1 de abril de 2016 LHP Shawn Morimando asignado a Akron RubberDucks de Columbus Clippers. 14 de marzo de 2016 Cleveland Indians opcionado LHP Shawn Morimando para Columbus Clippers. 20 de noviembre de 2015 Cleveland Indians seleccionado el contrato de Shawn Morimando de Akron RubberDucks. 18 de julio de 2014 LHP Shawn Morimando asignado a Akron RubberDucks de Carolina Mudcats. 1 de junio de 2014 LHP Shawn Morimando asignado a Carolina Mudcats de Akron RubberDucks. 30 de mayo de 2014 LHP Shawn Morimando asignado a Akron RubberDucks de Carolina Mudcats. 1 de abril de 2013 LHP Shawn Morimando asignado a Carolina Mudcats de Lake County Captains. 6 de mayo de 2012 Shawn Morimando asignado a Lake County Captains de AZL Indians. 20 de agosto de 2011 Shawn Morimando asignado a AZL Indians. 12 de agosto de 2011 Cleveland Indians firmado LHP Shawn Morimando.